Browse: Home / affine-cipher ~ An implementation of the historycal affine cipher and a Brute Force Attack. 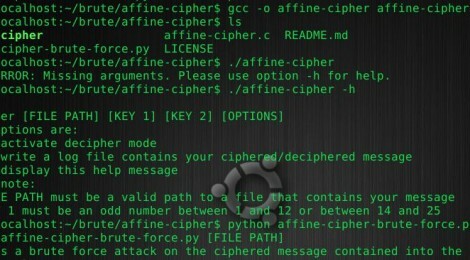 affine-chiper is An implementation of the historycal affine chiper written in C and a Brute Force Attack written in Python. “The affine cipher is a type of monoalphabetic substitution cipher, wherein each letter in an alphabet is mapped to its numeric equivalent, encrypted using a simple mathematical function, and converted back to a letter. The formula used means that each letter encrypts to one other letter, and back again, meaning the cipher is essentially a standard substitution cipher with a rule governing which letter goes to which. As such, it has the weaknesses of all substitution ciphers. Each letter is enciphered with the function (ax+b)\mod(26), where b is the magnitude of the shift.” – taken from Wikipedia – for further information see here. In this repository you can find my version of the cipher and a simple script in written in Python that forces the cipher in a few seconds doing a Brute Force Attack. ← Certerator – Code Signing Certificate Generator.